Her power gives her the voice, and the wings, of an angel. When a magical girl is also an idol singer. An idol singer gains the ability to fight crime (often by way of singing). A girl becomes an idol singer through the use of magic. This type of magical girl is the one that uses the Wish Fulfillment appeal of the genre the most. While the other two types use their powers to do good deeds or fight the good fight, the Magical Girls here use the powers they gain to achieve their dreams of stardom, although they can use Magic Music. As the protagonists here tend to be too young to be part of the musical industry, Older Alter Ego is often used. Note; the character has to be a magical girl, not just someone with music-related powers. A Sub-Trope of Magical Girl and Idol Singer. Pretty much everyone in AKB0048, an idol group that also fights evil. Additionally, the show is based around the real life idol group AKB48. Aikatsu! (short for "Idol Katsudou") lacks the "fighting against evil" aspect, but it's very much magical so it still counts. Barajou no Kiss features a Gender Flipped version with Suzumura Idel and Hasuzaki Yakoh. Brocken Blood: The main character becomes a Magical Boy and then he dresses as a girl and becomes an idol in order to find enemies. The person who suggested/forced him to be the idol sometimes forgets that the main goal is to find villains. Inverted in DokiDoki! PreCure, where Makoto's normal form is the Magical Girl Warrior Cure Sword, and her disguise is Idol Singer "MakoPi" on earth. Dream Festival! works under the same conditions as Aikatsu does; that is to say, they use the same card system in order to transform the singers and give them new outfits. In Fairy Idol Kanon, Kanon and her friends Marika and Kodama meet a fairy named Alto, who gives them the ability to become idol singers in order to save the fairy world. Full Moon o Sagashite (pictured) is a manga where a very young girl gains the ability to transform into a teenage girl. This also allows her to sing by (temporarily) removing the throat cancer that is otherwise stopping her. A rarer example since magic has nothing to do with her singing or performances, with the exception of a few sparkly effects, such as the occasional wings. Her performances are done solely on her own abilities. Hime Chen Otogi Chikku Idol Lilpri is about three girls who transform into princesses (Snow White, Cinderella, and Moon Princess Kaguya) in order to restore an ailing Fairyland by spreading happiness in the human world. By becoming a girl group. In Hugtto! Pretty Cure, both Cure Ma'Cherie and Cure Amour have this motif. They even perform a duet in their first battle. Idol Dreams (31 Ai Dream) has a twist on the genre - rather than being a child with an Older Alter Ego, the heroine is a Christmas Cake Office Lady who becomes a teenager thanks to an experimental drug (as opposed to magic), and uses her new youth to become an idol. Jewelpet: Magical Change: Larimar has a subplot where, thanks to her ability to become a teenaged human girl, she becomes an idol singer. Key from Key the Metal Idol could count when one notes her revered and dreaded magical abilities. This being said, she is also a deconstruction of this trope, just as her, Miho, and Beniko serve to deconstruct the Idol Singer proper. Macross Delta: Even if Walkure operate via Sufficiently Advanced Technology, they're close enough, with the transformation sequences and curing Var Syndrome via music. The Trope Maker is Magical Angel Creamy Mami. A girl aids an alien and is granted the ability to become a (just barely) adult. She very quickly realizes that she has no idea what to do with herself as a grownup, then stumbles across a talent contest/scouting mission. Her powers give her an invisible band and special effects, and she gets hired as an idol singer. Hilarity Ensues, though there are more serious bits. Magical Stage Fancy Lala is another classical version of the Magical Girl Idol Singer, using the powers granted by her Weasel Mascots to get an adult disguise and a beautiful singing voice. Harbour Light Story Fashion Lala, the original OVA, uses dancing instead of singing, but otherwise fights perfectly. Magical Star Magical Emi: Although Emi is a Stage Magician rather than an Idol Singer, her story still follows the Magic Idol Singer template. She even dabbles in Idol Singer territory by combining her magic shows with musical accompaniment. Mahou Shoujo Ore has both the secret identity and the Magical Girl Warrior form of Saki work as idols, though Saki herself is unpopular in her line of work. 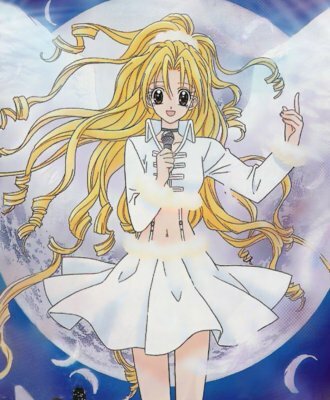 Mermaid Melody Pichi Pichi Pitch is a cross of this and Magical Girl Warrior, with mermaids. Mink uses this trope, except her transformation isn't done by magic but instead with "secret technology from the future." Later, her two friends join her. Ojamajo Doremi gives us Onpu Segawa who, in addition to being a Cute Witch, is also The Rival Dark Magical Girl who used her powers for selfish reasons... at first. A male version appears in the first episode of Osomatsu-san when the brothers reinvent themselves as an idol group who regularly saves the planet. Pretty Rhythm Aurora Dream has the main characters as ice skaters instead of idol singers and they lack Older Alter Egos, but otherwise, the show fits the genre pretty well. Its spinoff series PriPara and Kiratto Pri☆Chan and male focused movie series KING OF PRISM by Prettyrhythm are equally as magical. Sailor Moon gives us the Starlights, Sailor Star Maker, Sailor Star Healer, and Sailor Star Fighter, who diguised as a male pop group called the Three Lights on Earth. It's also worth noting that Sailor Venus's dream is to become this - and she is in the live action adaptation (see below). Senki Zesshou Symphogear has the main characters being one part Magic Idol singer and one part Magical Girl Warrior. And it's awesome. In Show by Rock! !, every main character is a member of some form of band, and gains the power to fight using their music while simultaneously attempting to achieve stardom. It's explained as musicians that have abnormally large potential having the ability to fight against Dark monsters, with Cyan having the most potential out of all of them. Kazuho Haneyama (otherwise known as "Pop☆Step") of Vigilante: My Hero Academia Illegals fashions herself as one, although it's unknown if she's truly trying to be a hero or just wants to get noticed. In The Asterisk War, Sylvia Lyyneheym is both the world's most famous idol,and a Strega with the power to use her singing to do about anything as long as she has a song for it. In the The World God Only Knows spin-off Magical Star Kanon 100%, Kanon becomes a magical warrior who fights with the power of song. Alison "Dazzler" Blaire of the X-Men, a singer with the ability to turn light into sound and vice versa. She can use most powers seen with manipulators of sound or light. This also results in her shows looking freaking awesome. Naturally, she changes with what sort of music is popular at the time; when introduced, she was billed as the first disco-themed superhero! She's also a Disc-One Nuke in the arcade game; her sonic explosions will clear a lot of Mooks from your path. In the comics at the time, she was actually far more likely to use Jem-esque effects. Full Life Wo Sagashite makes Lisa Simpson into one. Well, technically a "magical saxophone player", but it still counts. Starlight Is For Always is a Next-Gen Fic starring Jerrica's daughter Pilar, who discovers the "ghost" of Jem really Synergy and uses the earrings she is given to become the idol singer Jax. Leona from Star Darlings is a downplayed version - she's not an actual idol singer (although she dreams of being one), but she possesses magical powers and has an amazing singing voice. Minako Aino from Pretty Guardian Sailor Moon is a famous Idol Singer by day and a Sailor Guardian, Sailor V/Venus, by night. She turned Sailor Mars/Rei Hino into one under the stage name of Mars Reiko. Mio Kuroki is an evil example. The main characters of the 2017 tokusatsu series, Idol x Warrior Miracle Tunes! are members of an idol group given the power to transform into magic warriors in order to recover the magical Sound Jewels. Asaka Nachi from Dragon Quest: Angels of a Sleeping World is a Siren who utilizes her voice to aid her allies and cripple her enemies. Santana from Earthbound The Rainbow Omen is able to use Miracle Voice to imitate one. Every single Trickstar in the Yu-Gi-Oh! TCG resembles one of these. In Princess: The Hopeful, any Princess who is also a Troubadour qualifies as this trope. Sun from Milky Way Andthe Galaxy Girls, to the point where her singing illuminates the entire Solar System (well, she IS The Sun). Ar Tonelico 2: Cloche and Luca invoke this trope in some of their outfits. Mind you, they are already "magical", "idol", and "singer" in their normal life (which is in a magical world); this is simply going with the most common implementation of archetype. In the 3DS version of Dragon Quest VIII, the Nitid Tutu makes Jessica Albert look like one, complete with a headset. Final Fantasy X-2 features the Songstress as one of the Dresspheres that the three heroines can don - gaining magical dancing and singing abilities. This is tied to the plot - as Yuna uses these powers to help influence peace in Spira. Additionally the original wearer of the Songstress dressphere Lenne was one too - she was a famous singer that was also a summoner fighting on the front lines in the Machina War. Athena Asamiya from The King of Fighters is an Idol Singer with Psychic Powers, and she uses the KOF tournaments as a way to both fight for justice and boost her popularity. By the time KOF 96 starts, she's already a massive hit around the world. Sona from League of Legends is a Magic Idol Performer. Even Swain admits her music is lovely when he saw her solo tour. Funny enough, when she's with her band, she steps out of the spotlight and sticks to rhythm guitar; Karthus is the lead singer. Puella Magi Madoka Magica Portable has Mami becoming one in a special route. Miranda from the Warcraft III custom campaign Wanderers of Sorceria: beloved idol singer by day, Magical Girl fighting crime in the name of justice and love by night. The heroine of Wonder Momo is a young idol singer who possesses the ability to transform into an armoured action hero in order to save the world from alien invaders. The plot of the game Idol Mahou Shoujo Chiruchiru Michiru - unpopular idol Michiru makes a wish for popularity on a falling star which turns out to be a magical cat named Nyanmel, and is turned into a magical girl in order to save the world. Cornelia aka Rachel in Radiata Stories, to the point where she wouldn't be out of place in her own anime. Magical Girl Cano of Crusaders Quest is a famous pop-star who uses the love of her fans to fire magic beams at enemies. Cesela from Aura Kingdom claims to be in a rock band, and uses magic as her primary form of fighting. Shinbi of Paragon is a famous pop star with the ability to summon wolves. Aqua of Trouble Witches is a mermaid singer who is also capable of using water magic. The titular Lily of Lilys Day Off is revealed to be one in the second ending. This is the most popular career for graduates in How To Date A Magical Girl!. Galaxy Fraulein Yuna is a teen celebrity/Idol Singer who is tasked with saving the entire universe from the forces of Darkness as the Savior of Light. The Mahoshi of Tokyo Magic Star are idol singers who become magical girls in order to defend the world from a rival agency's plans to fill the world with despair using their own idols. Weiss of RWBY is an aversion - while she's an idol singer and a warrior, both skills appear to be unrelated. An (extremely large) version shows up for one scene in Megatokyo. Emi from Metacarpolis started as a Magical Girl Warrior and only became a Magic Idol Singer after she was recruited by an entertainment conglomerate. Jem would probably be the closest western counterpart of the classic Magic Idol singer, only she's already an adult and uses highly-advanced technology instead of magic to achieve the disguise. LoliRock has elements of both this and Magical Girl Warrior. The main characters use their innate magical singing talents in order to maintain thriving popstar careers for their civilian identities. My Little Pony: Equestria Girls  Rainbow Rocks has elements of this building on the Magical Girl Warrior tropes present in the previous My Little Pony: Equestria Girls film by making said magic only work when the girls perform in their band since Twilight Sparkle went back to Equestria. Additionally the villains are Equestria's versions of the Sirens - banished to the human world. Still able to cause discord with their voices, they pass themselves off as a Girl Group in the school's battle of the bands.